View other articles in "On Production" issue of magazine. Virtually all Friends oppose nuclear bombs. This is, of course, because we have a Peace Testimony. However, not all Friends realize that the world’s great religions are now being challenged to help oppose humanity’s ignorance about nuclear waste. Unfortunately, the uranium-based process of producing nuclear energy has the disadvantage of also producing vast amounts of hazardous nuclear waste, radioactive material which cannot not be used for energy production. We now have an ever-increasing mountain of nuclear waste that we don’t know what to do with. According to a 2012 report by the U.S. Nuclear Regualtory Commission (NRC), the amount of commercial spent fuel that was stored at commercial nuclear power plants at the end of 2011 was about 67,500 Metric Tons of Uranium (MTU). The commission also reported this amount is expected to increase at a rate of approximately 2,000 MTU per year. For many years, the NRC planned to move U.S. commercial nuclear waste, currently stored in above-ground tanks all over the country, into a single underground storage facility, which the government would build at Yucca Mountain in Nevada. However, Nevada residents strongly opposed this plan, questions were raised about the legitimacy of the science underlying geological profiles of the site, and the U.S. Department of Engergy filed a motion in 2010 to withdraw its licensing application for the Yucca Mountain facility. Even if the Yucca Mountain facility were to be built, however, the most waste it could hold would be 77,000 MTU, according to a statutory limit set during the facility’s permitting process. Considering, the currently growing quantities of spent uranium in the U.S. (see above), the storage capacity needed for U.S. commercal nuclear waste would exceed the planned capacity at Yucca Mountain as early as 2016. Gregory Jaczko, ex-chair of the NRC, now advocates “pulling the plug on nuclear.” He believes that another Fukushima-type accident is “unacceptable to society.” The sooner we pull the plug on nuclear power, the less nuclear waste there will be existing as a burden on us, our children, their children, and so on, way beyond the seventh generation. And this burden will indeed remain hazardous for many generations. 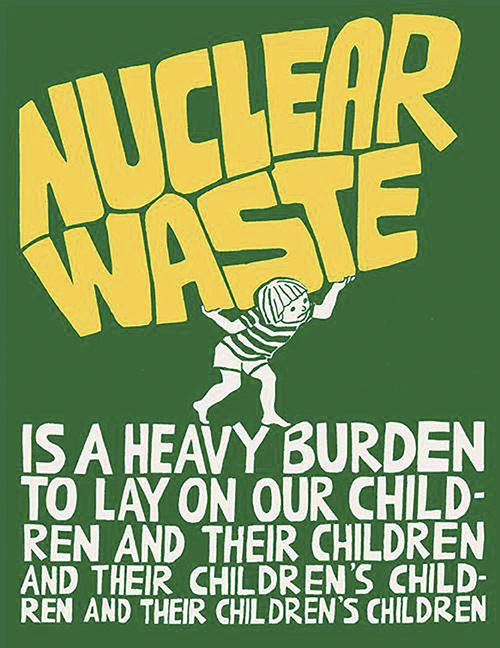 Standards set for nuclear waste depositories by the Environmental Protection Agency in 1985 presumed that nuclear waste remains hazardous for 10,000 years. Those standards were challenged by opposing scientists and thrown out by a U.S. Appeals Court in 1987. Congress commissioned the National Acaemy of Sciences to review the question, and the Academy concluded in 1992 that the “regulatory horizon” for nuclear waste storage should be set at 1,000,000 years. That’s right: hazardous for one million years. This last task – passing the baton of information through a continual series of new generations – is one that religious communities are particually well suited to fulfill. Many religious traditions and beliefs indeed have been long-lived. The earliest religious writings date from about 3000-3500 BCE. The oldest Hindu texts were written at least as early as 1200 BCE. The earliest Hebrew writings date from about 900 BCE. The oldest branch of Buddhism, Theravada, was founded around 250 BCE. Christianity and Islam have also been around for a quite some time. Good work has been done on questions of how to warn people in the far-distant future about the hazards of nuclear waste: What language to use? What symbols? In 1991, researchers from many fields – law, sociology, history, archeology, linguistics, and engineering – gathered in Oslo for a conference entitled, “Transmittal of Information Over Extremely Long Periods of Time.” The conference proceedings were based on the assumption that humans would create deep geological waste burial facilities that will remain "safe forever.” Even if that were possible, humanity could still face the problem of “historical discontinuties” (natural disasters, wars, epidemics) that could erase all archived information about the waste facilities. In such a situation, humans might not even know that thousands of tons of toxic nuclear waste were buried right under their feet. If people happened to unearth that waste, they might have no idea that it was dangerous. One Oslo participant, Knut S. Selmer, emphasized that such knowledge must be transmitted from generation to generation through person-to-person interactions. Examples of ancient written messages that were ignored for decades by modern archeologists helped to underline the point that a written record is not enough. Selmer stated that "‘personalizing’ must be the key word. Human beings are the most important factor." Based on his belief that world religions will outlive contemporary legal structures, Selmer concluded, “. . . the only possible way to influence human activity in a very distant future goes through religion. One must approach the leading circles of the great world religions, and persuade them that we are under an obligation to warn our distant descendants of the deadly dangers which we are creating in the environment . . . If the message could be given a form which was common to the world religions and which formed part of their rites and practices, one might hope that the message would survive and motivate people in a distant future." Henriette Groot holds a doctorate in psychology and worked for the U.S. Veterans Administration. She “dropped out” to sail (almost) all the way around the world with husband, Albert C. Mayes. She became a Quaker in Queensland, Australia, and is now a member of Central Coast Meeting (PYM) and an activist with a particular concern about nuclear waste.